Ready to Host a 30-Day Positivity Challenge? I've got a beautiful and inspiring content pack for you right here! Each time I read it, I'm inspired all over again. I really think your readers will be, too. This page features ALL the PLR Articles and Exercises listed in our "30 Days to a More Optimistic You" Positivity Challenge. A set of beautifully and thoughtfully written meditations for Days 1 through 30 of this month-long event to present to your readers. enjoy 20% off when you buy all 30 days of content together right now! No Need for a coupon. Hi, busy blogger friend. :) Do you think a Positivity Challenge would be so much fun and such a business booster to launch via email, blog or social media? A 30-Day Positivity Challenge is the perfect way to connect with your readers, fans and followers while establishing a positive presence for your business. I ran a blogger's challenge during the holiday season several years back. It was thoroughly enjoyable for me as well as for the participants who also had their own online businesses and blogs that they wanted to generate more readership for. The event brought us all closer, got everyone in the Christmas spirit, and we all got to check off our daily blogging initiative to drive more traffic and visitors to our websites! Why Run a 30-Day Positivity Challenge? 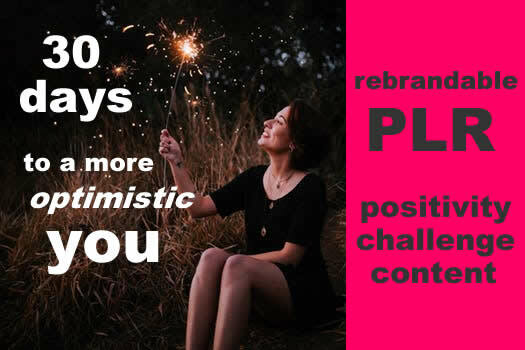 What Can You Do With This "30 Days to a More Optimistic You" Rebrandable Content Series? What's Included in the "30 Days to a More Optimistic You" PLR Pack for Days 1 thru 6? What's Included in the "30 Days to a More Optimistic You" Positivity Challenge PLR Pack for Days 7 thru 12? 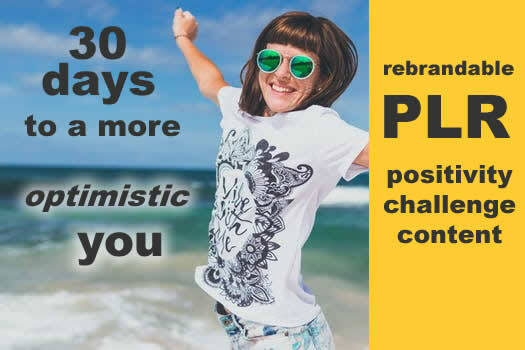 What's Included in the "30 Days to a More Optimistic You" Positivity Challenge PLR Pack for Days 13 thru 18? What's Included in the "30 Days to a More Optimistic You" Positivity Challenge PLR Pack for Days 19 thru 24? What's Included in the "30 Days to a More Optimistic You" Positivity Challenge PLR Pack for Days 24 thru 30? 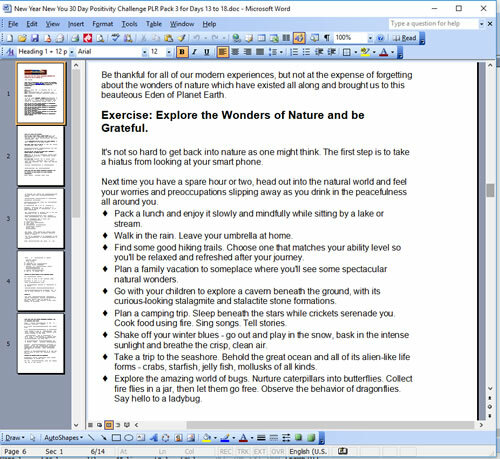 How similar is this content to the "Attitude of Gratitude,"30 Days Blessed This Christmas" challenge/New Year, New YOu PLR released during the 2017 holiday season? This is ALMOST the same exact content... BUT what I did was edit out all of the "Attitude of Gratitude/30 Days Blessed/New Year, New You" references and change the wording a bit here and there so that this speaks to a more generic, positivity theme. Should I buy this if I already purchased the Attitude of Gratitude OR "30 Days Blessed" Christmas PLR packs, but never ran the event after all? No. You should NOT purchase this PLR if you already bought the 30-Day Attitude of Gratitude or 30 Days Blessed Christmas challenge PLR. In that case, I will make this file accessible from your user account. My gift to you... the entire 30-day challenge fully edited, just because I'm delighted to have you as my PLR customer!